Laura Hely Hutchinson in Music on 28 July, 2015. Gengahr supporting Alvvays at Birthdays. Talented North London based band Gengahr were playing stadium tours with Alt-J and The Macabees before they’d even released an EP. Having met at school, the band released some demos on Soundcloud, like many artists these days, and everything has spiralled from there. Following the release of their extremely successful debut album ‘A Dream Outside’, I got the chance to speak to Felix Bushe, frontman of Gengahr about band life…and dinosaurs. Hey guys! Thanks a lot for taking the time to answer some questions. What’ve you been up to since the release of your debut album ‘A Dream Outside’? Felix: We’ve mostly been playing festivals since the release. At the moment we are in Australia, we played Splendour In the Grass yesterday, which was awesome! What’s the best festival you’ve ever attended and is it the same as the festival you’d most like to play? Felix: Dan was at Primavera this year and said it was amazing. We’ve played loads of great festivals this year but Primavera and Coachella are two we are yet to experience but hopefully next year! What’s the best gig you’ve ever been to and why was it so special? Felix: I’m not sure about ‘best ever’ but certainly my favourite of recent times has got to be Ariel Pink at the Electric Ballroom in London. It’s a really great sounding room and I had never seen Ariel Pink live before. We are all big fans of his music and the show was mesmerising. You’ve known each other and have been playing music as a group for quite a while now. Did you reach a stage where you thought “we’re good, we need to start getting this music out to people” and purposely make it happen, or did the popularity and fans just come naturally without much effort? Felix: No there was no realisation or anything. We just recorded a bunch of demos and stuck them up on Soundcloud. We had no idea how people would respond to the tracks but the response was a real pleasant surprise. Do you guys prefer playing massive venues or slightly smaller, more intimate venues and do you have to change up sets depending on the crowd size? Felix: I think the shows are always made great by the crowd attending. As a band I think we are probably still more comfortable playing the smaller venues but that’s probably just because it’s what we are most used to. In saying that though we have been really enjoying playing some of the bigger stages at festivals this year. Do you find yourselves analysing live bands you watch and albums you listen to more now that you’re in the music business or can you still just relax and be just like any other fans? Felix: I think i always try to enjoy music as a fan but at times it is difficult not to dissect everything. When you spend so much time working on your own music it can be hard to ‘just listen’ to music but I don’t see that as a problem really. Tame Impala are an influence of yours. On their new album they tend to stick to similar styles as their previous EP’s, but they pull it off because it’s a great style. On the other hand bands like Radiohead have gone through so many different genres and make worthy big risks. Do you think you’ll stick to developing your original style or would you like to experiment with other genres? Felix: We never make conscious decisions when it comes to style and genre, we always try to just let things happen naturally so it’s a difficult question to answer right now. We have only just started writing new music and it’s hard to say whether any of it will feature on our next album so I guess we will just have to wait and see what feels right at the time. Are you fans of any genres of music completely different to your own that might surprise fans such as classical or even dubstep? 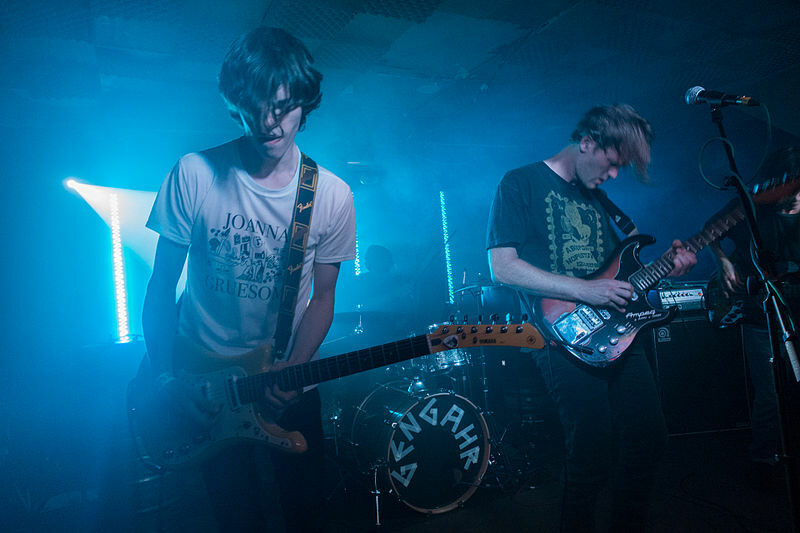 Finally, the name ‘Gengahr’ comes from your joint favourite Pokemon. If you could have any special power what would it be and why? Make sure you check out Gengahr’s debut album ‘A Dream Outside’.